The time is short, and the impulse to follow the crowd is strong. Take ice cream. Every day and night, a line forms outside Salt & Straw on Abbot Kinney Blvd. in Venice. The crowd starts at the guide ropes inside the shop, spills out the door, then wraps around the building and hugs the brick exterior wall for almost the full block. A full block! Boy, you’d think, that must be the best ice cream in Los Angeles. Boy, you’d say to yourself, I’d better get in line. You get what I mean. You feel the pressure to stand by the opinions of the people who have supported you, voted for you, paid you to speak, and who may even be your source for a post-Senate livelihood. If they say something is good and worthwhile, what courage it must take to leave that line, drive just a mile east, and find your own store? Say, for instance, a store like Wanderlust Creamery. Wanderlust Creamery never has a line. It’s a wide, pleasant glass-fronted shop, sharing a small parking lot with Floyds 99, where the rock music is loud and the haircut includes a hot lather, neck shave and shoulder massage (my go-tos are Melinda and Carly, who knows a lot about weight-lifting and antique kimonos). The Wanderlust concept is that all the flavors are inspired by the world travels of the owners, a pair of Cal State University of Northridge grads named Adrienne Balangan, the chef, and Jon-Patrick Lopez, the business partner. Tonka Bean uses the vanilla-like bean from South America along with toasted almond, caramel and clove. It’s more complicated and somehow more soothing than straight vanilla. From Iceland come the flavors that make Pretzel and Rugbraud, a sweet/savory play of sugar, rye and salt. (Rugbraud is traditionally steamed Icelandic rye bread). A vanilla base diffuses the sweetness of Sticky Rice and Mango, making the ice cream more pleasant, to me, than the real Thai dessert. Abuelita Malted Crunch tastes like a better version of the famous Mexican hot chocolate brand. Kinder Bueno, inspired by European travels, has bits of those ubiquitous milk-chocolate eggs. Smoked Vanilla Thai Tea has all the star anise tones of Thai iced tea with a strong, charred Earl Grey flavor. Japanese Neopolitan subs the usual vanilla, chocolate and strawberry for matcha, black sesame and smoky hojicha tea. Honey Lavender, the “Inspired by Provence” entry, has bits of rose petal crystals that make it even more intensely floral. 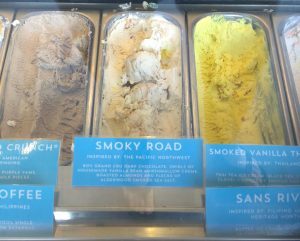 At the opposite end of the delicacy spectrum is Smoky Road, inspired by the Pacific Northwest. Imagine chocolate and sugar caramelized over an alder wood campfire. If you want a simple, familiar flavor, try the Earl Grey, straight outta Great Britain. These are playful, but thoughtful. The combinations may be original, in the sense that even in their country of origin these ingredients don’t usually appear in ice creams. But they aren’t complete flights of fancy. They have anchors in old, established cuisines. They make sense. For Filipino Heritage Month, Borlongan, the Filipino-American co-owner, went deep. There’s a Coconut Beurre Noisette flavored with latik, fried coconut milk curds. Philippine’s national citrus appears as Kalamansi Pie, using meringue, graham crumbs and a curd made from those tart, lime-scented fruits. Pandan Tres Leches infuses rich cream with the grassy, fragrant Southeast Asian leaf. And Barako Coffee uses what seems to be a keg of kapeng barako coffee varietal, which is bound to be the next big thing after arabica. Can an ice cream be macho? This one is. The travel theme is strong. On a giant menu board, each flavor is listed on its own luggage tag-shaped placard. An antiqued globe sits on the counter, a cone holder inside. Starbucks did pretty well leading yuppies to believe they were actually traversing the world when they bought a cup of coffee. Wanderlust should work the same magic with millennials. I haven’t been to the company’s other locations in Tarzana, Atwater Village and downtown at the Sunday Smorgasburg, but at least in Venice, Wanderlust isn’t drawing the crowds its product deserves. Salt & Straw has the lines. Its base custard leaves a richer trail in your mouth, like someone dragged a vanilla-scented Chapstick across your hard palate. The flavors at the Oregon-based Salt & Straw aren’t rooted in much beyond culinary experimentation. Some make sense, some don’t, but they are all conversation pieces, if not outright dares. Charcoal? Cracked pepper? Turkey stuffing? It’s funny because it’s true. The two flavors I most enjoy at Wanderlust are the Gianduja and the Belgian Dark Chocolate Sorbet. The former uses imported Italian hazelnut paste. Both have an intense, cool creaminess that melts away and leaves behind all the mysterious winey, bitter, sweet and fruity notes of the best dark chocolate. The fact that neither of these two flavors uses a drop of milk or dairy products seems like an uncorroborated lie. But it’s 100 percent true, and these are the two best vegan ice desserts I’ve tried in Los Angeles. 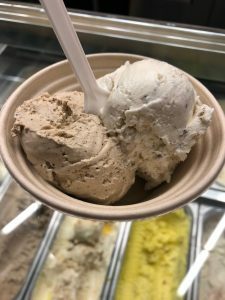 It’s not immediately obvious why all those millennials will wait an hour or more for a scoop of Salt & Straw when they could take a five minute e-scooter ride to Wanderlust, order, eat and still have time to register to vote. Maybe it’s because getting in line is as much a way to cement group belonging as it is to register an opinion. I get that too. But sometimes, Senators, you need to leave the crowd behind. You need do what everybody else isn’t doing. Sometimes you find that the better choice, the better ice cream, is the one that isn’t on the cool street, that doesn’t attract the loudest crowd, the one whose fans don’t have to keep convincing you how good it is. Senators, sometimes, despite your so-called friends telling you otherwise, you should just listen to that still, small voice within, and get out of line. I’ve eaten at Wanderlust over a dozen times. I’ve often bought pints of their vegan Gianduja and Belgian Dark Chocolate to serve as a non-dairy dessert at home. Please sign up for weekly Los Angeles food and restaurant reviews.